The Black Death, also known as the “bubonic plague,” was a horrible illness that affected Europe and Asia from the 14th through the 15th century. During this period, known today as the Middle Ages, 25 million people died from the Black Death. The Black Death started in Asia. The Mongol Army then carried the disease to Russia. Next, rats and fleas traveled on ships from Russian ports and carried the disease back to and all over Europe. 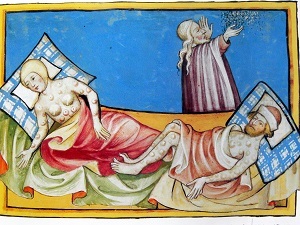 The disease was nicknamed the Black Death because black spots grew on victims’ bodies. Other symptoms included swelling under the armpits and at the top of the legs and coughing up blood. The Black Death was so terrible that it killed 15 million more people than World War I did. A lot of people might not think of disease as a natural disaster, but The Black Death outbreak was clearly a devastating disaster.